A head on collision between a car and a semi truck early this morning (12/8) has left one Northeast Michigan woman in the hospital. According to a press release from the Cheboygan County Sheriffs office 37-year-old Samantha Parrott of Cheboygan was traveling southbound on M-27 shortly after 6 A.M. this morning. 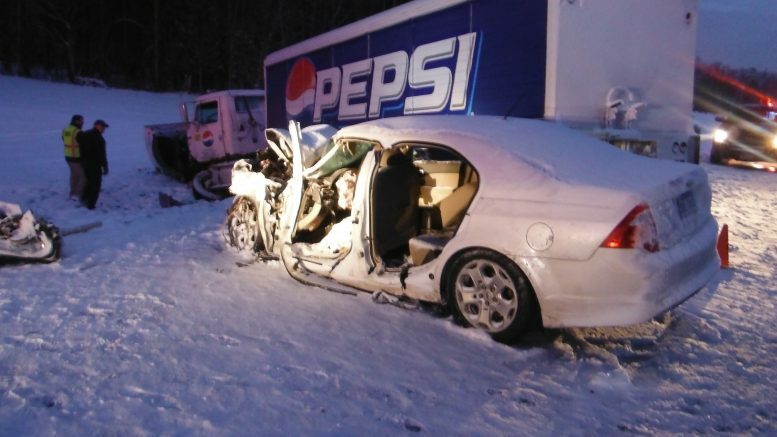 Parrott lost control of her 2011 Ford Fusion due to the snowy conditions and crossed the center line into the path of a north bound semi-truck driven by a 35-year-old man from Petoskey. Both vehicles then left the roadway and came to an uncontrolled rest on the west side of M-27. Parrot had to be extricated from her vehicle, and she was transported to McLaren Hospital Petoskey and is listed in stable condition. According to sheriff Dale Clarmont the roads were slippery due to snow and blowing snow and speed is also a factor in the crash – Both drivers were wearing seatbelts and alcohol is not a factor. He reminds all drivers to slow down in slippery conditions and to have their headlights on.